February can be an ugly month up here. Days are short, and our usually reliable sun can disappear for days on end. Aside from being a thankfully short month, the only good thing about February is the owls. 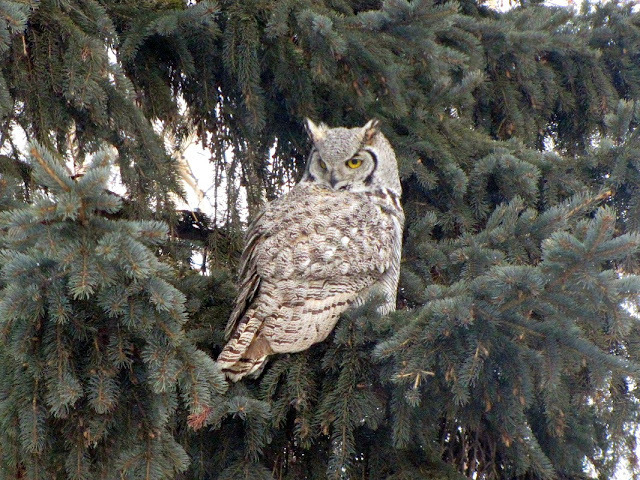 For the past few years, I've had a resident great-horned owl roosting in the back yard. Last year this bird hung around for 6 weeks, sleeping here during the day and gliding out to hunt at dusk. I've no idea why the resident birds didn't mob him incessantly, but they normally allowed him his daily nap. The grey squirrels in the yard though, did have a habit of waking him with their rapid twisting and turing in the trees. Unfortunately I didn't have my backyard guest this month. 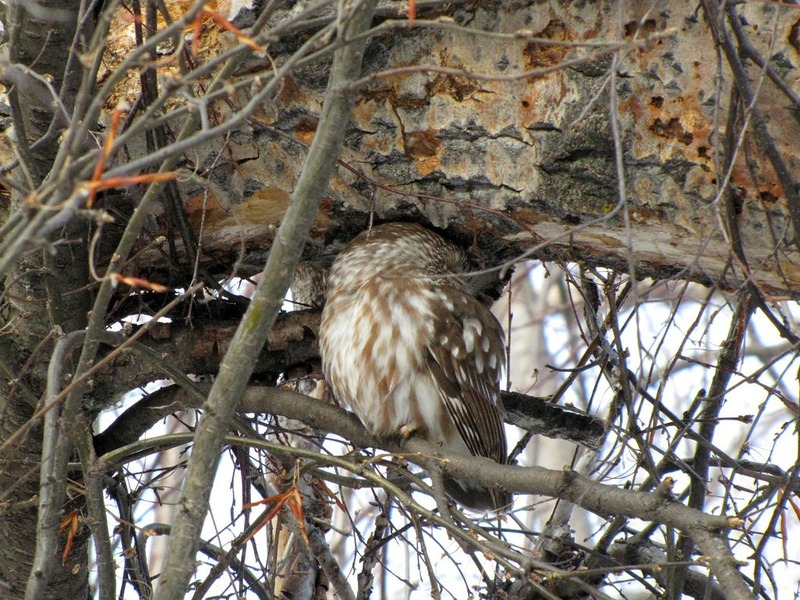 I'm still looking for him, but there were other owls around to keep me occupied. 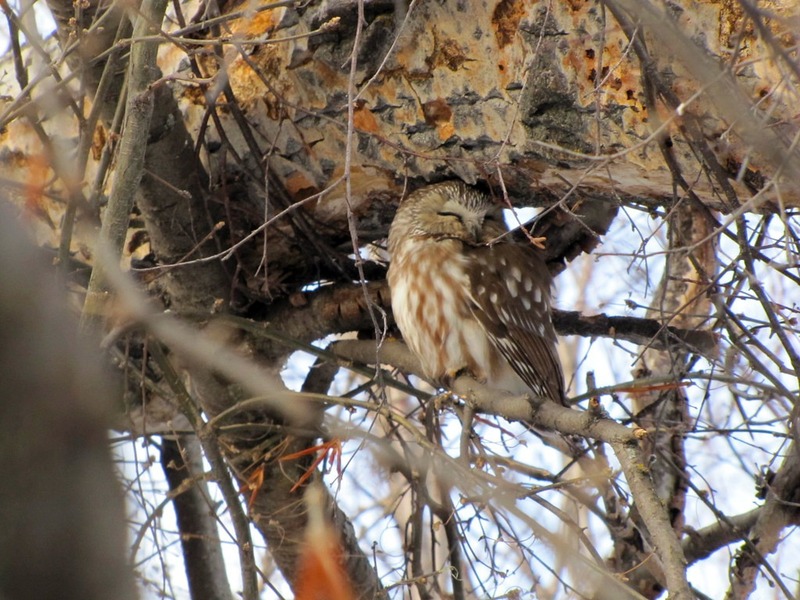 This little northern saw-whet was spotted by a birding group at a nearby local park. When I was there, he almost made the effort to open his eyes and see what was going on, but decided against it and went back to sleep. February is always a good month to go for a drive. 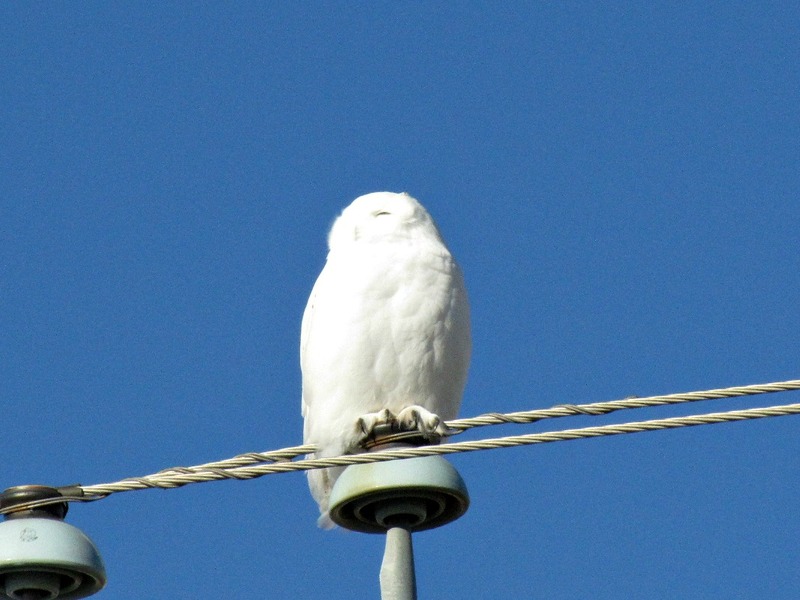 Snowy owls love the flat prairie grasslands just east of the city, and this year they were even easier to see than normal. They don't care a whit if a human is watching either, and also fall asleep in my presence. 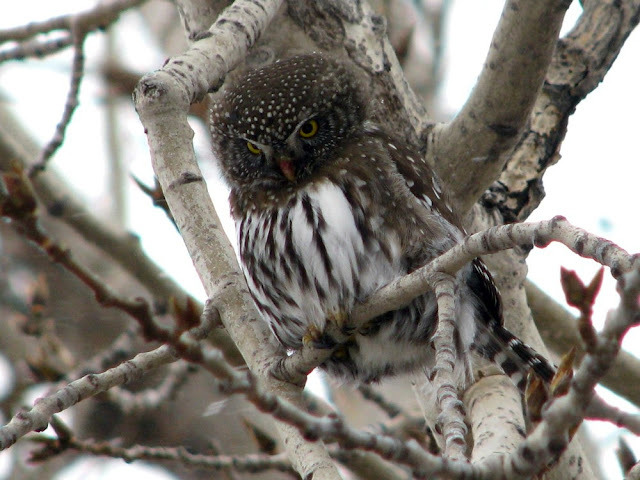 There is a large local natural area that is home to a couple of northern pygmy owls in the winter. Last year these birds had an address - look up into the trees at the sound end of bridge #6. This year they've been a little harder to find, but they had their share of photo-ops last February. 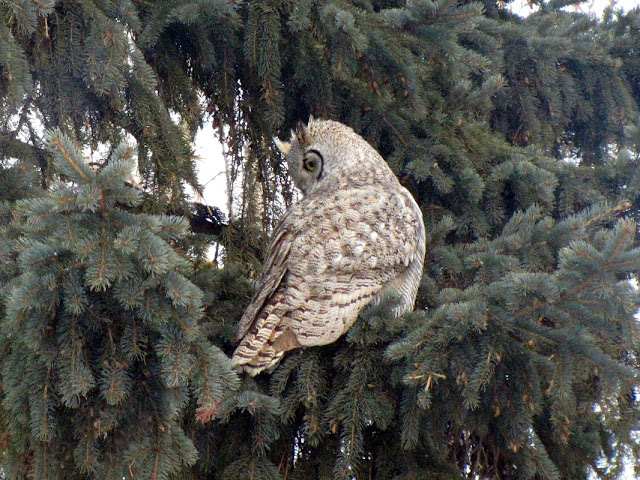 One conspicuous absence from this post are the Great-grey owls which can be found just west of the city, but they're worth an entire post on their own. Just as soon as I manage to get some pictures. This is a terrific post Pat! 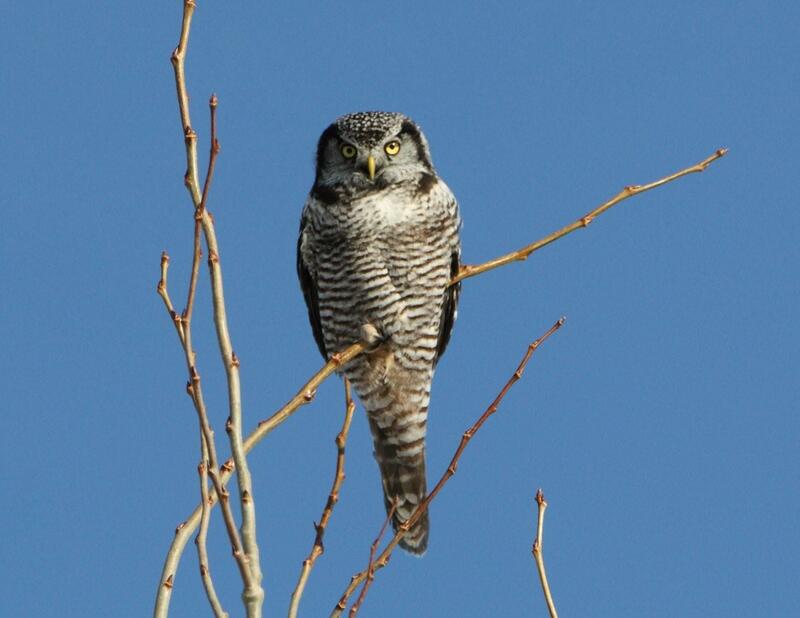 I wish we had some of the owls here that you have photographed, in particilar the Snowy and Northern Hawk Owls. All of the images are lovely! 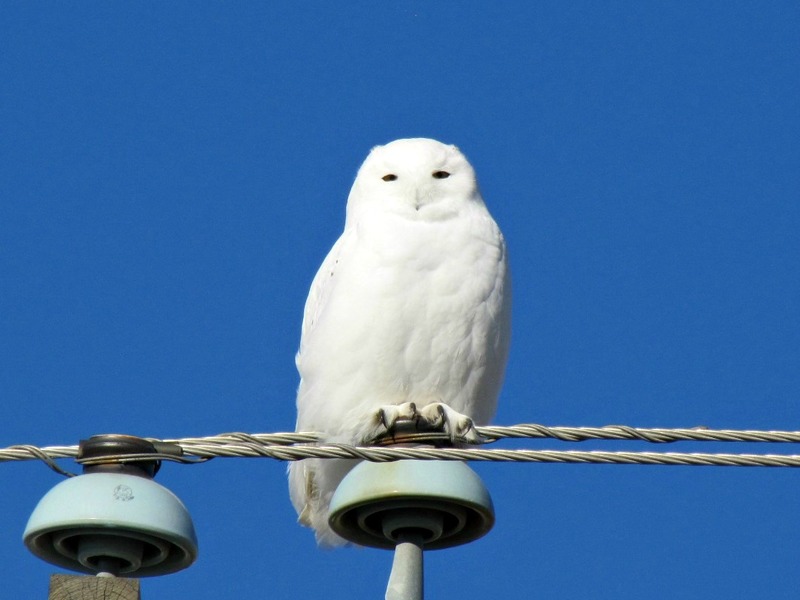 Your owl photos make me very envious, and you have some lovely ones! I wish we had mare owls here. I'd really love to see a Snowy Owl and a Northern Hawk Owl. Wonderful post! Wonderful photos Pat, you are so blessed to see them, wonderful photos. Fantastic post! I really enjoyed your owl photos! What a great backyard guest! Thank you all for the wonderful comments - glad you liked my owls! You are so lucky to have all those shots of them in the wild. Wow. Terrific photos, Pat. Hope your GHO shows up again. That's just terrific to have him roosting right in your back yard. Thank you Scott and Tomas. 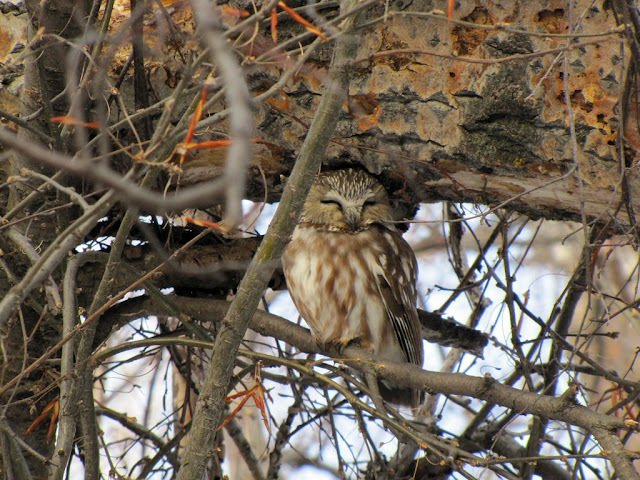 I do feel extraordinarily lucky when it comes to owl sightings. 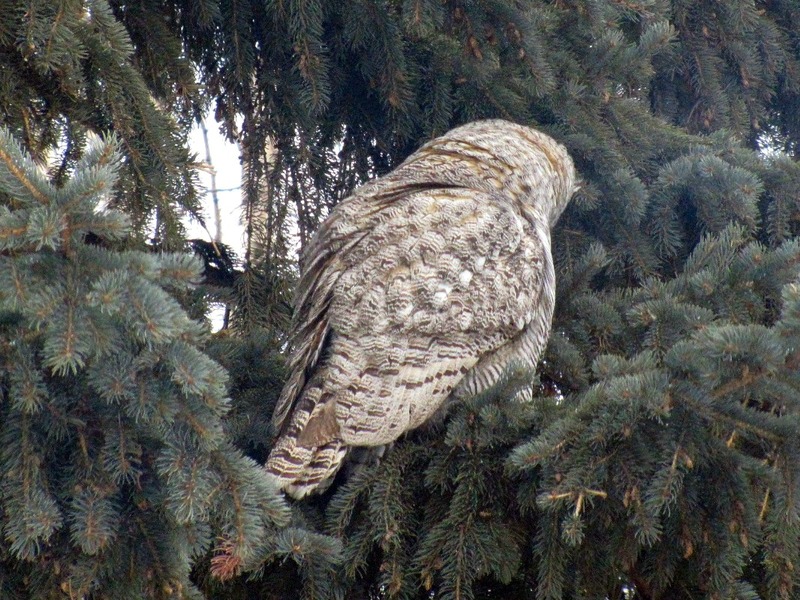 I hope my luck lasts for the Great-gray owls! Pat, I so enjoyed scrolling through this wonderful post! You have a nice variety of owls in your area. Too bad your resident Great Horned Owl has not made an appearance yet. My fingers are crossed that you will see him soon. He's gorgeous! I've only seen two of the owls you featured in this post, so it's especially nice to see photos of others I have yet to spot. Love the Northern Hawk Owl and Northern Saw-whet captures, though all are fantastic! Well, I can see how those owls would cheer up a gloomy February! 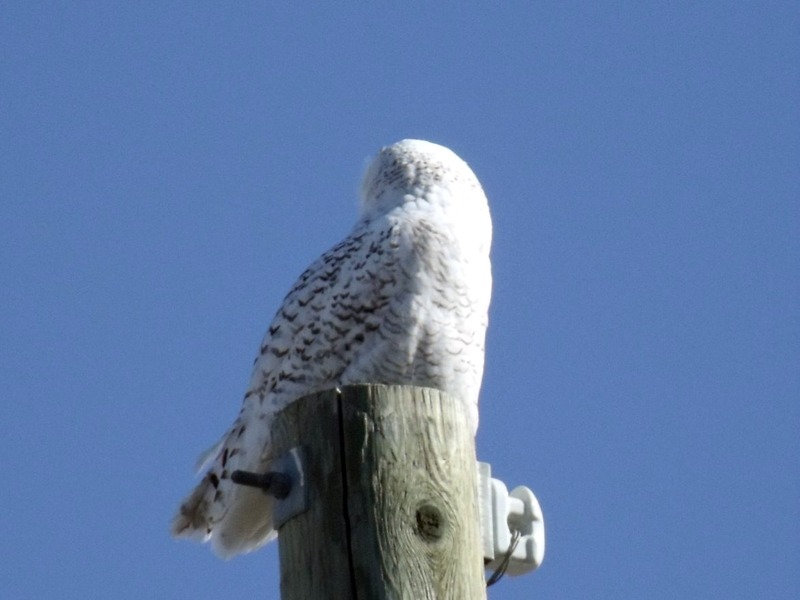 I just saw my first snowy Owl and Northern Hawk owl this year. I have seen the Great Horned owl many times and in many states but have yet to see a Saw-whet owl or a pygmy owl of any kind! A fun post to read and see! How Old Is That Eagle? Birding Florida - come on down! Birds and Pellets...a new birding blog trend?